Recently, China's leading international children's products company Goodbaby Group and the world's largest sports brand Nike signed an e-commerce cooperation agreement in Shanghai. 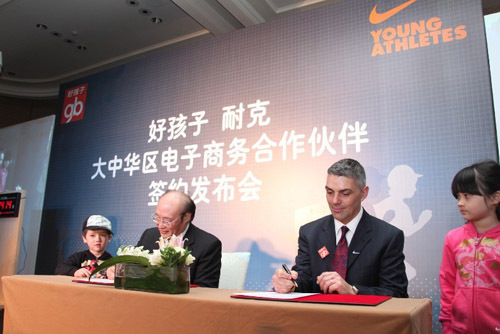 In the future, the Goodbaby Group will be solely responsible for the online sales of Nike Young Athletes in China. This strong alliance means that Goodbaby Group will become an e-commerce partner of Nike Greater China, and Nike Young Athletes will also establish an official flagship store on China's e-commerce platform. Song Zhenghuan, Chairman of Goodbaby Group, and Qikaige, Nike Sports Vice President and General Manager of Nike Greater China attended the event and completed the signing ceremony on site. Goodbaby has established a good relationship with Nike Sports in the past 10 years. At the same time, Goodbaby has the largest global purchase of Nike in children's wear. It is Nike's largest global distributor of children's products. It is based on the previous cooperation between the two parties and the common goal of developing high-end children's wear e-commerce, which has contributed to this cooperation. Goodbaby builds a multi-brand, full-category e-commerce service platform with its large terminal network and a growing membership scale. The two brands coincide in this direction. Currently, Goodbaby's official flagship store already has well-known international brands such as Goodbaby and Nike Young Athletes. The category covers baby strollers, car seats, dining chairs, baby carriages, clothing, and maternal and child care. There are 16 categories such as supplies, which almost satisfies all the needs of mothers for pre-pregnancy to their preschool age. In order to better promote the Nike Young Athletes brand, Goodbaby has set up a separate brand area for the four major commodity categories to facilitate the user's selection of products. In addition, Goodbaby also cooperates with the relatively mature and large-scale B2C websites in the industry, and places its own and self-branded products in different product series according to the classification, which greatly increases the consumer's contact rate with the products. In addition, "haohaizi.com" also established a link entrance on Goodbaby's official website. It is understood that Goodbaby's official website is named Goodbaby Science Parenting Network. It is a charitable platform for goodchildren to persist in promoting scientific childcare. Currently, there are 1,500 parenting experts who have long-term online parenting consultations and provide interactive forums. In the 12 years since its launch, it has a large number of stable members, and its daily visits have exceeded 280,000 person-times, and the maximum number of people even exceeded 1.08 million. This mature and huge advantage platform has saved a lot of popularity for the flagship store for good kids. E-commerce is a key development business for good children in the future, and it is also an integral part of its four-network convergence strategy. Song Zheng also emphasized: "Four network convergence will be the four core competitiveness of good children in the future, namely multimedia community and transaction network, offline physical network, logistics distribution and service network, and customer relationship management network, and the construction of four major networks. This is also the key to continuing to promote the future development of Nike Young Athletes and good children." Once a good boy four-network integration strategy is formed, Nike Young Athletes will have an unparalleled sales platform in China to showcase Nike products and brand appeal. "We are very pleased to be able to form an alliance with such a strong partner as the Goodbaby Group. This is also Nike China's first cooperation project in the new e-commerce space," said Qi Kaige, Vice President of Nike Sports and General Manager of Nike Greater China. "We firmly believe that with the support and cooperation of the Goodbaby Group, our future will be bright." In the future, a good boy will not only be a company that manufactures and sells maternal and infant products, but will also allow Chinese brands to go global. The â€œDream Factoryâ€ that has entered China, on the four-network-embedded experiential business service platform, will surely be able to realize that Song Zheng is still stressed at the conference. â€œAs of December 31, 2015, Goodbaby (China) is to achieve The strategic goal of billions of dollars in annual revenue." Established in 1989, Goodbaby Group is one of the outstanding members and leaders of the world children's products industry, and is also the largest enterprise group in China that specializes in children's products. "Good boy" is "China Famous Brand" and "Chinese Famous Brand". Goodbaby Group adheres to the concept of "caring for children, serving families, and returning to society" and is committed to "improving children's living environment and improving children's quality of life". We are specialized in the research and development, manufacturing, distribution, and retail of mother and baby products. Provide a complete range of childcare products that are safe, easy to use and stylish. As an industry leader, Goodbaby Group actively advocates and undertakes corporate social responsibility. In the past 20 years, we have fulfilled our basic social responsibilities to ensure product quality and safety, actively participated in the research, drafting and revision of national standards for related products including developed countries such as Europe, America and Japan, and established world-class laboratories to lead the industry. In July 2000, he established the "Children's Science Parenting Network" and contacted more than 1,000 Chinese parenting science experts to provide a comprehensive range of scientific childcare information services for the general parenting families. In 2010, Goodbaby took the lead in the global children's products industry to introduce the green development concept of "Cradle to Cradle" without carbon emission into the R&D and operation links. It is committed to creating a better living environment for children, a clean and pollution-free earth. .
Headquartered in Beaverton, Oregon, USA, Nike is dedicated to the design, sale, and operation of sports footwear, apparel, equipment and accessories for all types of sports and fitness. It is a leader in the industry. Nikeâ€™s wholly owned subsidiaries include Converse, which designs, sells and manages sports footwear, apparel and accessories; Cole Haan Holdings, which designs, sells and operates high-end footwear, handbags, accessories and outerwear; Umbro Co., Ltd., the UK's leading global football brand, and Hurley International, design, sell and operate extreme sports footwear and footwear, apparel and accessories for young people. Globe shares a collection ofcreative DIY toy, which always delights kids and adults. Diy Toys help to enlighten your children much better than those electronic Toys or APPs game. Globe has a great collection of trendy DIY toys for you and your children, why not spend time to check it out in Globe's showroom and Globe's website ? We are manufacturer of Diy Toys in China, if you want to buy Toy Diy Solar Exploration Set,Toy Diy Power Space Vehicle,Toy Diy Build And Play please contact us.